Where are you from? Your profession? After three wonderful decades in Gainesville, my husband’s new job has relocated us to Riverview in the Tampa Bay area. While in Gainesville, I enjoyed a 25-year career in student services at the University of Florida. In 2012, I left UF to volunteer fulltime for water-related non-profits. When and how did you become interested in paddling? I did a bit of canoeing as a kid on youth group trips in Florida—I remember a Peace River weekend during my middle school years. In the 90’s, we rented kayaks to explore the beautiful spring-fed rivers around Gainesville—Ichetucknee, Santa Fe, and Suwannee to the north, and Silver, Rainbow, and Ocklawaha to the south. We eventually bought our own kayaks and started adding multi-day expeditions to our day trips. Having done some long hiking trips, I was delighted to see how much easier it is to fit camping gear, food, and water into a kayak vs. a backpack. Since those early days, our fleet has grown to four kayaks and, recently, two paddleboards. We’re now starting to get to know some of the west coast waterways around our new home. Where is your favorite place to paddle? For pure relaxation and joy, breathtaking color, and wildlife above and below the water’s surface, I love Florida’s spring-fed streams. Favorites include Juniper, Rock Springs, Weeki Wachee, Santa Fe, Silver, and Ichetucknee (outside of the summer tubing season). I’m pleased to see Paddle Florida featuring so many springs on their upcoming 2017-18 trip schedule. What’s the most interesting thing that ever happened to you on a paddling trip? Paddling with friends near Cabbage Key off Florida’s southwest coast a few years ago, a cownose ray leaped out of the water inches from my kayak, bounced off my deck on the way down, before splashing back into the water. It took me by such surprise, I almost flipped over from the shock of it. A truly thrilling experience! How many Paddle Florida trips have you gone on and to where? Nearly all of them. I was one of the 163 paddlers who joined Paddle Florida’s inaugural trip on the Suwannee River in 2008. We enjoyed that experience so much that we latched on to each new trip as they were offered. Describe your role with Paddle Florida. In 2011, I joined the Board of Directors as Vice President. For the next four years, I volunteered on nearly every trip and worked behind the scenes on grant writing and marketing projects. That role was formalized in 2016 with my new position as Communications Coordinator, and I have stepped back a bit from trips as Paddle Florida’s pool of wonderful and talented trip volunteers has grown. Can you describe a Paddle Florida trip highlight? One feature that I think makes the Paddle Florida experience unique and meaningful is the evening program component involving speakers and musicians. I’m picturing dulcimer god Bing Futch slaying the theme from The Last of the Mohicans with the warm, moonlit waters off the Florida Keys as a back drop. I’m remembering the springs along the Suwannee I jumped into to cool off in during the day, and then hearing in the evening from cave diver Annette Long how those clear blue pools connect to my drinking water. Many of us can explore Florida’s waterways on our own, but these enriching moments of connection each evening make the Paddle Florida experience truly memorable. What advice do you have for folks considering a Paddle Florida trip? If you enjoy paddling and camping, why not combine the two? By providing meals, on-water support, and hauling your camping gear, Paddle Florida takes much of the logistical work out of a multi-day trip…you’re left to just paddle and enjoy yourself. I love seeing newbies come and make new friends, gain confidence on the water, and morph into skilled paddling veterans over the course of a few trips. 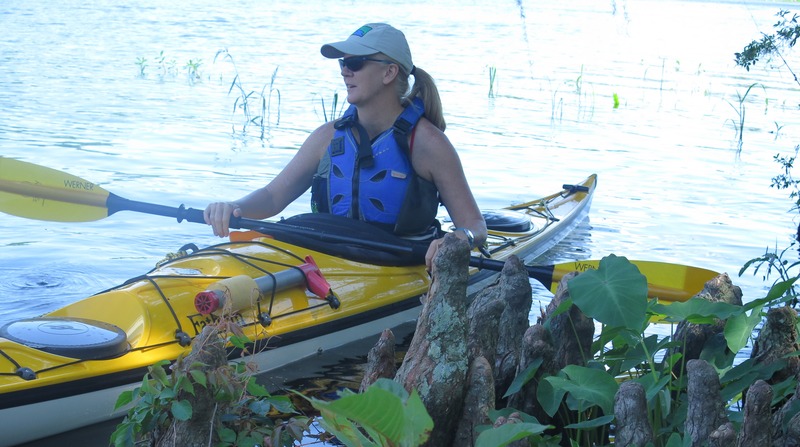 Paddle Florida provides a supportive environment in which to test and stretch your skills along some of the most gorgeous waterways the state has to offer. Don’t wait to sign up for a trip—it may fill up!